Bone recession - the solution is here! If you have not had your missing teeth replaced during the years it is very likely that your bone has already receded to a certain amount. The receded bone will not be able to hold a conventional implant. The solution in this case is the strengthening of the bone structure. Would you like to find out how it is possible? Do you know what the current situation of your bone level is? A lot are not aware of their bone recession until our implantologists call their attention to it. Fortunately, it is very easy to determine how severe the situation is: an OPG x-ray is needed. In order to the right amount of information, the implantologists working with us need a recent OPG x-ray. Have you already got an OPG x-ray? Send it to us! If you wish to replace your missing teeth with implants the first step is having an OPG x-ray taken. It can be taken at our partner clinic in London but if you already own one please send it to us so that we can create a personalised treatment plan for you. Feel free to send us your OPG x-ray by email: info@tibordental.com! Why is the right bone needed? The first case is the most optimal for the insertion of conventional implants. In this case the structure and level of the bone is strong enough to absorb the implants. In opposition, in the second case the bone has to be strengthened before implantation. In the past in the third case implantation was not an option due to severe bone loss. Thanks to the revolutionary new implant family implantation is possible. If you wish to find out how, please click here! So if your bone is not thick enough and its structure is not optimal for implantation there is a need for a professional strengthening. You should not stop here. In our next blog we will write about the bone strengthening procedure that might seem complicated but is very useful. The aim of a bone graft is to strengthen the bone structure with bone replacement materials. As regards bone replacement, it is advisable to differentiate between the upper and the lower jaws. During this procedure on the lower jaw the dentist cuts the gum and then the bone horizontally. After that the dentist fills the area between the upper and lower jawbone and closes the area with a membrane. He or she then closes the gum too so that the absorption of the bone replacement material can be a success in about 3-6 months. This is not the only way to put the bone replacement material on the jawbone. The other way is to fix a bone material (screws) to the area (after opening the gum) and then closes it. Similarly to the previous method 3-6 months are needed for the strengthening. This method is called onlay bone replacement. The most common problem with the upper jaw is the area of the sinus. It is very usual that the bone between the sinus and the teeth are very thin and implantation is not available. 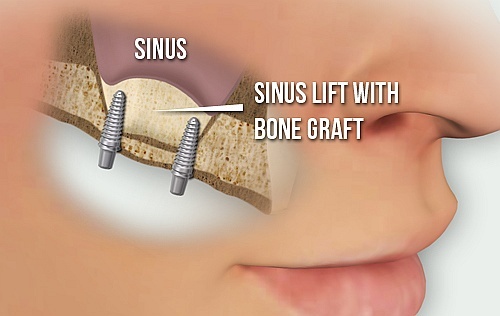 In this case not the only bone replacement method is used but the so-called sinus lift. 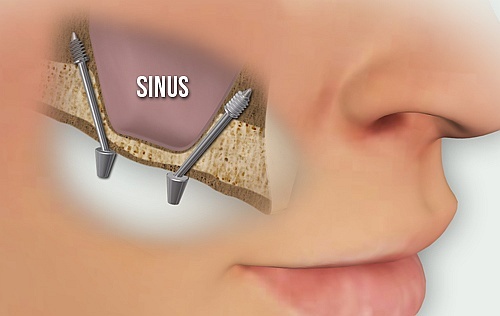 The first step of a sinus lift is opening the gum so that the area in question can be reached. A hole is then made in the bone with a special drill. While making the hole the periosteum is involved. Thank to this, the implantologist can place the bone replacement material under the periosteum. The hole is then closed with a membrane and the gum is stitched. The membrane can be absorbent or nonabsorbent. In the case of the latter another procedure is needed during which it is removed from the area. During the next 3-6 months osseointegration takes place making the bone strong and thick enough for implantation. What kinds of bone materials exist? Using other human and animal originated bone are hardly used. Usually the own bone (most commonly from other parts of the jawbone or the hip bone) is used or the synthetic materials. How do bone replacement materials work? Bone replacement materials do not really replace natural bone tissues but make it develop faster by creating a base for the bone tissues. During the above mentioned 3-6 months the healthy bone tissues fuse with the bone material that disappears later on letting the natural bone tissues take over. Implants can be inserted to the now strong bone structure as it is able to create a stable connection with the implants after about six months. Have you been waiting for so long for replacing your missing teeth? If you wish to have fix and permanent teeth, you need dental implants.